The Association of Fundraising Professionals (AFP) is the leading international association for fundraising professionals. Founded in 1960, the national organization of AFP serves more than 30,000 members in 227 chapters located throughout Canada, Mexico and the United States. AFP provides educational opportunities for professional fundraisers; promotes consistent high standards of professional practice; and assists in the exchange of ideas, information and research. The organization receives its revenue from membership dues, publication advertising and subscriptions, certification of fundraising executives, educational programs and the AFP Foundation. 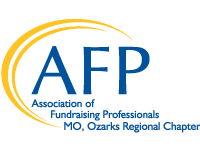 The Ozark Region Chapter of AFP, based in Springfield, Missouri, has grown considerably over the past several years and currently has a membership of approximately 80 members representing more than 50 non-profit agencies and organizations. preserve and promote philanthropy and volunteerism and high ethical standards in the fundraising profession.